Paris, the capital of France, is often called La Ville Lumière (meaning ‘The City of Light’), however, beneath this bustling European city of 12 million people, lies a dark subterranean world holding the remains of 6 million of its former inhabitants. These are the Paris Catacombs: a network of old caves, quarries and tunnels stretching hundreds of miles, and seemingly lined with the bones of the dead. Some areas are open to the public as museums, but since 1955 entrance to the majority of the underground space is prohibited. However this hasn’t stopped some thrill-seekers venturing into the cavernous passages that have been home to thousands of upon thousands of bones of the dead. As the water table has risen under the city, many of these spaces are now filled with cool and clean water. Locals are well aware of this, and, according to Bobrtimes , this year’s long, sweltering summer has seen an increase in illegal entrance to the catacombs as people seek a respite from the heat by using the subterranean pools as cooling zones. But these desperate measures could have dire consequences. Just last month, two teenagers were rescued from the catacombs after being lost in the vast network for 3 days. They were found by rescue dogs and were taken to hospital to be treated for hypothermia, reported The Guardian . It was not known exactly how the boys got lost, but this occurence, along with the recent Thai cave emergency rescue, highlights just how easy it can be to get lost or cut off in such environments. 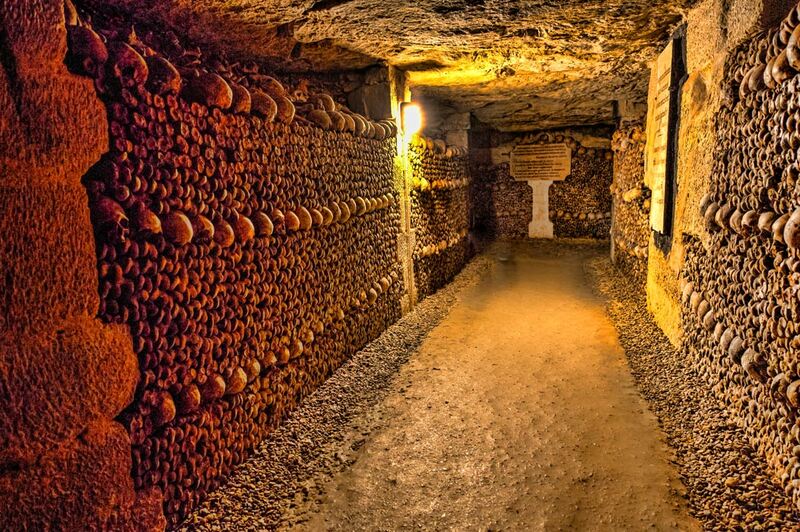 The Paris Catacombs have their origins in the limestone quarries situated on the outskirts of the city. This natural resource has been in use since the time of the Romans, and provided construction material for the city’s buildings, as well as contributed to the city’s growth and expansion. It was only after during the second half of the 18 th century, however, that the former limestone mines (now under the city as it expanded over the centuries) were transformed into burial places. By the 18 th century, Parisian cemeteries such as Les Innocents (the largest cemetery in Paris) were becoming overpopulated, giving rise to improper burials, open graves, and unearthed corpses. Quite naturally, people living close to such places began complaining about the strong stench of decomposing flesh and the spread of diseases from the cemeteries. In 1763, an edict was issued by Louis XV banning all burials from the capital. The Church, however, did not wish to disturb or move the cemeteries, and opposed the edict. As a result, nothing was done. The situation persisted until 1780, when an unusually long period of spring rain caused a wall around the Les Innocents to collapse, resulting in the spilling of rotting corpses into a neighboring property. By this time, the French authorities were forced to take action. In 1786, the former Tombe-Issoire quarries were blessed and consecrated, turning them into the Paris Catacombs . It took two years for all the bones from the Les Innocents to be transferred to the catacombs. Over the following decades, the bones of the dead were removed from cemeteries around Paris for reburial in the catacombs. Furthermore, the practice of burying the newly dead directly in the catacombs began after the French Revolution. It was only in 1859 that the final transfer of bones was undertaken during the renovation of Paris by Georges-Eugène Haussmann, and the work was finally completed in 1860. Seven years later, the catacombs were open to the public. In total the winding catacombs stretch over 300 kilometers (186 miles). Although the Paris Catacombs are still open to the general public today, access is limited to only a small fraction of the network. It has been illegal since 1955 to enter the other parts of the catacombs. Nevertheless, during the 1970s and 80s, the catacombs have been explored illegally by Parisian urban explorers known as Cataphiles. Some of the spaces have even been restored and turned into creative spaces. One of these underground caverns, for instance, was transformed into a secret amphitheater, complete with a giant cinema screen, projection equipment, a couple of films and seats. The neighboring area was revamped into a fully-stocked bar and a restaurant, perhaps where the patrons of the amphitheater could get a snack or a meal. It has been estimated that as many as 300 Cataphiles enter the catacombs each week via secret entrances. Non-Cataphiles and tourists, however, are not often welcome. From its beginnings as a limestone quarry to its use for the burial of the dead in the 18 th century, and the part it plays today in the lives of the Cataphiles, the Paris Catacombs have been an important feature of the city. Although systematic exploration of the underground tunnels may bring to light the extent of the catacombs, it would probably not meet with approval from all quarters. After all, the secrecy of the catacomb networks, and the opportunity to escape from the hustle and bustle of the city above, are attractive concepts to the Cataphiles, and they would probably not let go of their haunts so easily. All research I've done, and built upon conflicts with your report. Paris has only 2-3 million people, currently and the construction/ relocation took place over the span of 12 years not two, and people were buried in the catacombs during the revolution. The latter was not exclusive to post revolutionary burials.